Washington on the brink as new Shutdown looms. America could be sliding toward a new government shutdown and President Donald Trump may face a fateful choice over his border wall as another knife-edge week opens in Washington.Democratic and Republican negotiators last week seemed to be on course for a deal to fund the government and boost border security short of paying for a wall, and it seemed possible that Trump might grudgingly sign on.But the talks ground to a halt over the weekend in a dispute over limits demanded by Democrats on the number of places available in detention centers used by Immigration and Customs Enforcement operations away from border areas. Iran Marks 40 years since Islamic revolution. Hundreds of thousands of Iranians took to the streets of the capital Tehran on Monday to mark the 40th anniversary of the Islamic revolution, when Ayatollah Ruhollah Khomeini ousted the Shah’s last government. The march is the culmination of official celebrations called the “10 Day Dawn” that marks the period in February 1979 when the revolution’s leader Khomeini returned from exile and toppled the monarchy. 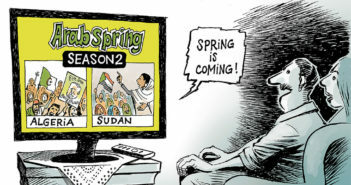 State TV showed crowds defying cold rainy weather and carrying Iranian flags while shouting “Death to Israel, Death to America,” trademark chants of the revolution which ousted the United States’ most important ally in the Middle East. Acting Pentagon chief makes unannounced Afghanistan trip. 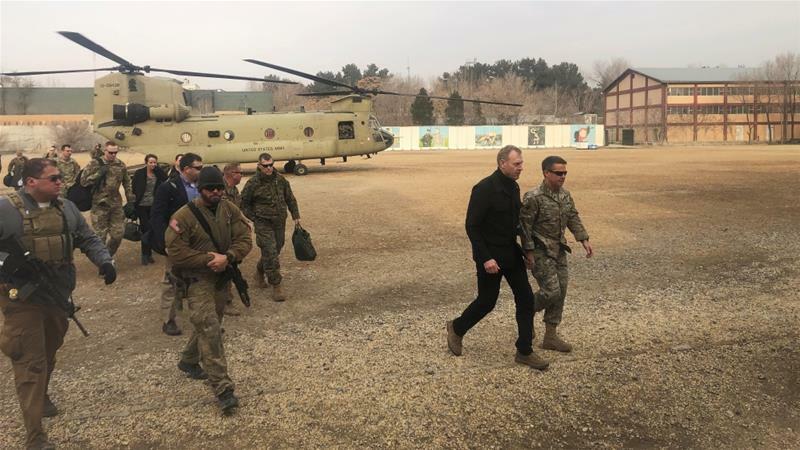 Patrick Shanahan, the acting secretary of defence, has arrived in Afghanistan on an unannounced visit amid a push by the United States to negotiate peace with the Taliban. Shanahan will meet Afghan President Ashraf Ghani, whose government was not part of major talks between the US and Taliban officials last month that officials hope could bring a breakthrough in the 17-year conflict. “It is important that the Afghan government is involved in discussions regarding Afghanistan,” Shanahan told a small group of reporters travelling with him on the surprise trip on Monday. Second Trump-Kim summit coming after scant signs of progress. President Donald Trump is set to meet North Korea’s Kim Jong Un in less than three weeks, yet the biggest question hanging over the leaders’ second summit is why they’re even having it. Since their historic face-to-face meeting in Singapore eight months ago, North Korea has made little progress toward giving up its nuclear weapons and continues to do what it can to evade sanctions. The top U.S. negotiator with Kim’s regime acknowledges that the two sides still don’t agree on what denuclearization might look like or what the U.S. might offer to satisfy him. The parade heads down Mott and Canal Streets, continues onto East Broadway toward the Manhattan Bridge and curves up through Sara D. Roosevelt Park via Forsythe and Eldridge Streets toward Grand Street. For more information, visit betterchinatown.com. The Westminster Dog Show is a long-running competition for dogs, with several categories in agility training as well as Best in Breed. Spectators can watch the dogs compete as well as see them get primped for their show time backstage. The show takes place on Monday, February 11 and Tuesday, February 12, 2019. Daytime sessions take place at the Piers from 8am to 4:30pm and evening sessions are located at Madison Sqare Garden from 6pm to 11:30pm. This week’s Monday Briefing was brought to you by Zuha Siddiqui.